OREP and Working RE Magazine are dedicated to providing quality service to home inspectors, not only through comprehensive and affordable E&O policies, but also through providing assistance and discounts on home inspector continuing education. Staying up to date and educated on new requirements and getting a refresher on some older ones is vital to maintaining success in your business. With partnerships with McKissock Education and Calypso Continuing Education, OREP/Working RE are well suited to help inspectors with education and requirement needs. A wide variety of approved classes are offered are amazing discounts, some even as low as administrative costs only. See below and find out how home inspector continuing education with OREP/Working RE can help you! The online course Home Inspection Safety, offered by McKissock Education ($45/3 hrs. ), is available at administrative costs only to OREP Members and Working RE Paid Subscribers ($5.74; varies by state). OREP has partnered with McKissock Education to provide multiple discounts on CE requirement classes to OREP Members / Working RE Paid Subscribers. To receive the discount- Request your discount link here. This course is designed to fulfill credit requirements for the American Society of Home Inspectors (ASHI) mandatory annual continuing education. The course objective is to help students understand the general principles and characteristics of attic ventilation. This course will provide an in-depth look into plumbing cross connections, plumbing systems and why cross connections should be inspected or determined. This course will provide an in-depth look into energy usage, design, and building for residential structures. Though home inspections are not intended to be an energy audit, understanding energy efficiency and energy efficient construction can be very important for home inspectors. We will look at multiple components of residential construction and discuss ways to make homes more energy efficient. The overall course level is beginner to intermediate, and encompasses subjects appropriate for both residential and commercial home inspectors. It has been designed primarily as a review to reinforce basic foundation training and knowledge. It also provides additional insight that an inspector will require while investigating site preparation and construction during Phase Inspections. The following chapters are designed to familiarize the inspector with the accepted construction practices of foundations from the soil on up. This course includes material using the International Code Council’s 2012 International Residential Code for One and Two Family Dwellings (2012 IRC) Chapter 4 and other selected. While code is discussed, it is not the intention for this to be a “code” heavy course rather an expansion on areas of basic understanding that the inspector may not review very often. This course will provide some basic information on radon for residential properties. This is a great course for home inspectors to expand their knowledge. The overall course level is intermediate, and encompasses subjects appropriate for residential home inspectors. We will define radon gas and explain where it comes from, while discussing how it relates to the general home inspector. We will review common mitigation methods and how radon enters a structure. You will also learn commonly used words and their definitions. This course discusses important aspects of home inspection associated with identification and remediation methods for reactive drywall manufactured in China and imported into the United States between 2001 and 2009. Commonly referred to as corrosive, reactive, or defective Chinese drywall, its chemical composition has been shown to have negative effects on human health as well as metal components in the home. Not all drywall originating in China is defective, however. This course will provide recently revised guidelines for addressing the problem of defective drywall, as well as links to websites that will keep you current on this rapidly evolving issue. This course is designed to fulfill 4 hours of continuing education for Home Inspectors. This course will cover many aspects of practical reporting techniques as well as problems that many inspectors will face during the reporting process. The student will also learn about professionalism within the home inspector field. In this course the instructor will explain correct installation and inspection of electrical systems which are integral to a safe, secure, and functional home. The following chapters will also familiarize the inspector with accepted construction practices and required safety features of electrical work. Given the high degree of danger from incorrectly managed electrical systems, inspections to ensure compliance with relevant NFPA and NEC codes are of special concern. Upon completion the professional inspector will have a deeper understanding of electrical requirements and the codes most pertinent to any given dwelling. This course is designed to fulfill three hours of home inspection continuing education credits and the overall course level is intermediate, and encompasses subjects appropriate for residential home inspectors. This course is designed to fulfill eight hours of home inspection continuing education credit. The objective of this course is to provide students with an overview of interior and exterior inspection processes, through in-depth analyses of the attic, basement and crawlspace, kitchen and bedroom floors, garage, exterior walls and roofs, windows and doors, electrical elements, foundation walls, brick, concrete, yards and grading. The course is designed as a pictorial guide for students’ comprehensive understanding of home inspection elements. This course is geared for the residential inspector and the overall course level is basic. To sign up for any of these continuing education courses or to browse more classes in your state, please visit our OREP/McKissock portal. Here are a few relevant stories from Working RE Magazine concerning home inspector continuing education as well as a few more tips and lessons for free! 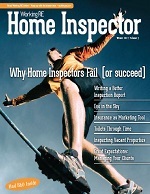 Click here for more articles and Working RE coverage of Home Inspector Continuing Education.